Rashid Khan has arrived to link up with his new Sussex Sharks teammates for the Vitality T20 Blast campaign. 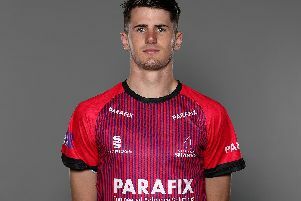 The world's best T20 bowler has joined the Sharks for the opening half of the campaign and is in line to make his debut in Chelmsford this evening (July 4). The 19-year-old said: "It's a pleasure to be here. I'm pretty excited for the first match to start. Playing for a county is always a pleasure and a big honour. I'm really excited to finally be here, and I will try my best to deliver well." For such a young player, Khan has a wealth of T20 experience following stunning performances in the Big Bash and the IPL. He is one of the biggest stars in world cricket right now, and cannot wait to link up with Jason Gillespie again. The pair worked together with the Adelaide Strikers, and the leg-spinner was integral to Dizzy's side, finishing joint top of the wicket-taking charts with 18 wickets in 11 innings, with an economy rate of 5.65 runs per over - the lowest in the tournament. "I had a good time with Dizzy in the Big Bash," said Khan. "It's really good to be here, back with him. He's really supportive, on the field and off the field, and I think the way he kept us in the Big Bash was amazing. Hopefully there will be lots of new things I will learn from him." Khan has also played with and against the likes of Chris Jordan, Tymal Mills, Jofra Archer and Luke Wright during his time playing around the world in T20 competitions. Khan said: "I know Chris Jordan from our time in the IPL. (Tymal) Mills is also here, (Jofra) Archer is here, Luke Wright - we had a good time in Australia, we met there. "I know a few players. I think we have a very good combination, a very good team - as a batting unit and a bowling unit. We just need to work together, believe in each other and support each other and hopefully we will go well!"